When you put on your bra, are you horrified to wear a fitted shirt over it? Do you loathe the idea of putting on a bathing suit top because of the bulge that appears on your back? Bra bulge, the fat that pours out above and below your bra straps, is something that many women experience and completely dread; in fact, it can make women so self conscious that they insist on wearing loose-fitting clothing in order to hide that unsightly back fat. Why does bra bulge happen? It’s a result of the weak muscles in your back. When the muscles in your back aren’t tight and defined, the skin around them becomes loose, and as a result, that dreaded back fat pours out of your bra, your bathing suit top or anything else that fits snuggly across that part of your back. Even if you are your ideal weight, you can still experience bra bulge. 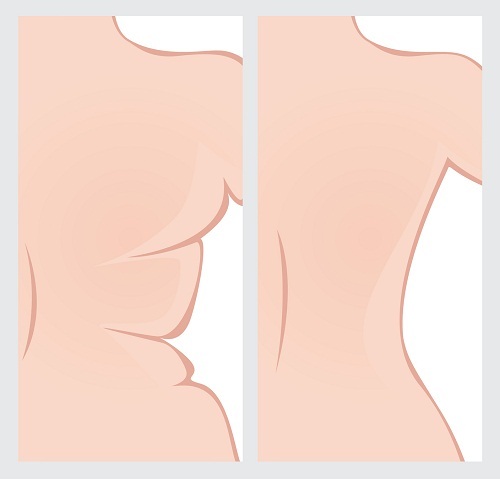 Fortunately, there is a way that you can battle that back fat bulge and get a smooth looking back. The cure: Exercise! The only way to get rid of that back bulge is to strengthen the muscles in your back, and in order to strengthen the muscles in your back, you’re going to need to exercise. What type of exercises work? Here are six that will get your back looking great!. T-Raises: This is a great way to get rid of that bulge. To do a T-raise, stand with your feet hip distance apart while holding a dumbbell in each hand. Bend at your knees and lean forward while keep your back straight. Hold the weights in front of you with your palms facing forward and then move your arms to the sides, forming the shape of a T. Bring the weights up to your shoulders and lower them. Do 15 reps.
Mountain Climbers – Get into the plan position. Bring your left knee toward your chest, put it back and then pull your right knee toward your chest, replicating the look of a climbing motion. Repeat the motion for 30 to 60 seconds. Rocking Plank – Get into the plank position. Using the muscles in your arms and your core, move your weight forward so that your shoulders and head are in front of your hands. Rock back to the starting position. Do 10 to 15 reps.
Push Up – This classic exercise is a great way to strengthen the muscles in your back. Do a total of 30. Burpee – This is a killer back – and all over – workout. Start in the plank position. Pull yourself up to the standing position and jump up in the air with your arms above your head. Come back down and back into the plank position. Do this motion as quickly as possible. Do 10 reps.
Single-Arm Dumbbell Raises – Lean forward, placing one hand on a wall in front of you. Hold a dumbbell in the other hand. Hold the weight down in front of your belly and slowly lift it up to your side. Do 10 reps and repeat on the other side.